Phil Wilson MP visited a project in Trimdon Village that is tackling isolation in later life to raise awareness of these vital services. He is encouraging those who are feeling isolated to get involved in the host of activities being offered across at the centre whilst also pressing for further financial support to keep these services going. Phil visited the ‘Over 60’s Project’ in Trimdon Village Hall. 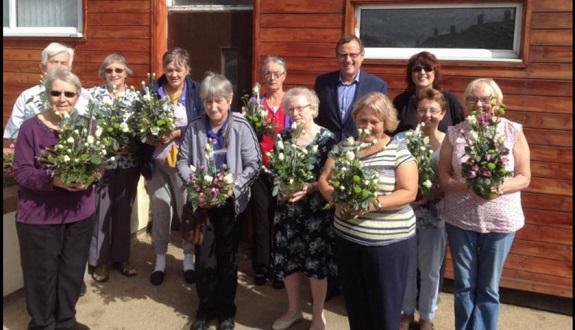 The ‘Over 60’s Project’ in Trimdon delivers a range of activities to those in later life, from flower arranging and sugar craft workshops to sound therapy sessions. All the activities are free of charge and include a free meal. “Seeing the services delivered and the enjoyment that those attending are finding has been fantastic, as was learning to bowl. There were people there from a wide age range and backgrounds and the thing that struck me most was the sense of friendship and community. I would encourage anyone to go along and have a go. “Loneliness causes untold personal suffering, it also has an impact on other areas such as mental and physical health and life expectancy. This can be costly, not just to families and individuals but to council and health services. There is thought to be more than one million people aged over 65 who are lonely in the UK, around 10-13% of older people. Recent statistics produced by Age UK, a national charity supporting those in later life, highlight that in Sedgefield constituency 5,825 people aged 65+ live alone and 1,170 people aged 65+ say they are often lonely. “Watching people turn up over 20 weeks ago all with large life stories of their own. Illness. Loneliness or isolated. I wasn’t sure how well this project would work. The variety of tutors we’ve been able to work have most certainly given everyone a new lease of life.